I love me some hot chocolate, especially on a cold winter’s night, while lounging on the couch catching up on my shows. I used to be guilty of buying the packaged stuff, which honestly doesn’t even taste that good. I was just too damn lazy to make it from scratch, until I came up with a solution: Make a large batch of ganache, scoop it, freeze it and store it in ziptop baggies. Now when I want a cup of the good stuff, all I have to do is warm it in some milk (and cream!) If you really want to do it up, make it with half and half, but that’s probably not the healthiest thing to do often. When I’m feeling bougie, which is pretty much always, I like to jazz it up with fun toppings. My favorite version is a S’mores Hot Chocolate. I add a dollop of fluff, whipped cream and some toasted marshmallows - and, don’t forget the graham crackers, for dipping! In a small saucepan, combine the milk and cream. Warm over a medium flame until it begins to steam. Add the Chocolate Ganache Balls and stir to melt. Continue to heat until desired temperature. 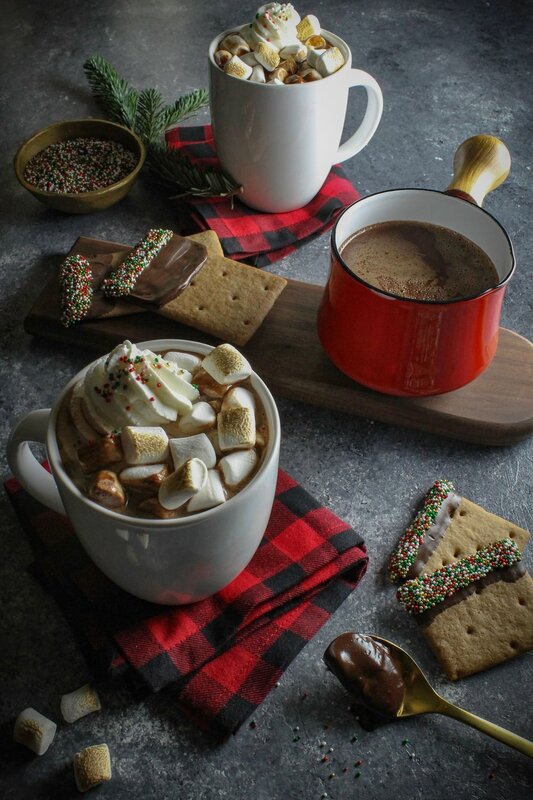 Pour into your favorite mug and top with whipped cream and your favorite toppings. Place the chocolate in a medium-sized, heat-resistant bowl. Meanwhile, in a small saucepan, combine the cream, sugar, cocoa powder and salt; whisk well. Warm over medium heat. Allow the cream to come to a gentle simmer, then pour it over the chocolate. Shake the bowl so that all the chocolate is submerged, then let it sit for 2 minutes before whisking until a homogeneous, silky ganache forms. Leave the ganache to set at room temperature. Use a medium-sized cookie scoop, about 1 ¼" diameter, to create mounds. Place the scooped mounds onto a plastic lined baking sheet and freeze until solid. Place the frozen mounds into a zip-top bag and store in the freezer until ready to use for up to 3 months.